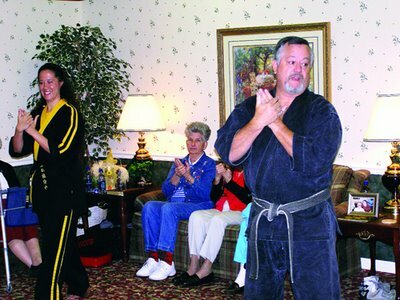 Tracy Bass, left, a fifth-degree black belt in karate, and her father, Bob Bass, an eighth-degree black belt and owner of the Bob Bass School of Karate, gave a demonstration Saturday morning to the residents of the Southern Oaks Assisted Living Center. The karate masters showed residents about stretching, gentle exercise, proper breathing and Chi energy. Just a short little blurb in the lifestyles section of a weekly county paper, but any good publicity is good publicity, right? I didn't go to the assisted living center, but Tracy said they were so sweet. Check out those gi's. The one looks velvet! No, not velvet. It's a black Iron Man that's just so old it's faded some. Actually looks like stonewashed black in person.